SUMMARY: After discovering her boyfriend's online cheating festivities, 16-year old Mallory swears off all technology and decides to live life like her grandmother did in 1962. She decides to complete a list her grandmother started when she was a sixteen: Run for secretary of the school pep club, host a fancy dinner party, sew her own homecoming dress, find a steady, and do something dangerous. Mallory is a totally NORMAL girl. She's not extremely beautiful or excessively smart or crazy popular. She's clueless and sometimes feels awkward. She doesn't always say or do the right thing. She has moments of weakness, and sometimes, she gives in to those moments. She's a relatable heroine with whom many readers will identify. Mallory's best friend is her younger sister. I have two younger sisters, and they hold a place in my heart that only they can fill. Sisters are more than best friends; they are forever friends (that's from a keychain my sister gave me). Two involved, annoying, smothering, arguing, parents who love each other but have their own issues and flaws. Mallory's family is realistic and has drama and is imperfect and real. Refreshing. Unplugging. I've been trying to do more of this lately. It's not as easy as you might think, but it's doable and totally wonderful. It's amazing how much more time is in the day when I do my "unplugged" days. Mallory is so wrapped-up in her boyfriend that she loses her own sense of self. It's realistic and happens all the time, and young girls will benefit from recognizing it. As in the book, these break-ups are probably the hardest. 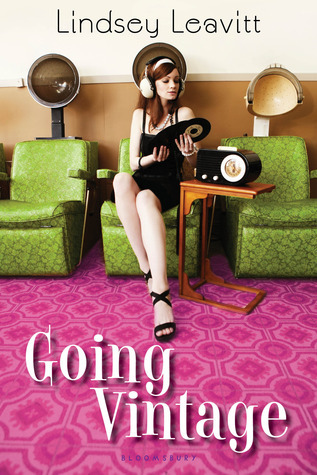 Going Vintage is an honest look at the problems modern technology can cause and how being a teen is hard, no matter what decade you live in. The "good old days" weren't all gumdrops and roses; instead, they featured the same kinds of problems against a different backdrop. THE BOTTOM LINE: Sweet, honest, and funny. Perfect for reading on the beach or on rainy, dateless Saturday nights. STATUS IN MY LIBRARY: It comes out on March 26, but I've already ordered three. I plan to add Going Vintage to our school's Lone Star Plus Reading List for the 2013-14 school year. 1st over I LOVE how you do your reviews! I know its not my first time saying that but its soooo good! Secondly this book sounds up my alley! Ill have to check it out! Great review!! I'm sooooo glad this one is a good read! I've been dying to read it since I read the synopsis! Have you read Freshman Year & Other Unnatural Disasters? The way you describe Mallory as being "real" reminds me of Kelsey from that book. It's a light, fun read that resonates very well with students. I also read this book and have pre-ordered for my library. Our reviews are very similar! Loved it.